Let's talk about various ways to wear turquoise and teal colors at work. Today's topic is 30 awesome ways to mix teal and turquoise garments and incorporate them into work look. It's no secret, turquoise is a very beautiful color what is considered to be a lucky hue in the Arabic countries. If you know how to wear it, then I am very happy for you, but I know ladies and friends who just make it all wrong. Keep it versatile, timeless and elegant by combining turquoise with ladylike and creamy outfits. How to dress in grey to impress everyone around? In today's article I want to draw your attention to these 26 grey color business attire looks for ladies, what will make you look both professional and elegant at the same time. Grey color is a versatile shade what is ideal for creating numerous of beautiful outfits. In this post I have gathered amazing office looks what will surely inspire you to wear something grey colored this year. This neutral color suits every woman, every skin tone, age and body type, all you have to do is to find your right shade. Some of you might think it's a boring color, but believe me, there are gorgeous updates what are ideal for daily wear, appointments, business meetings and other formal events. What to do if it's fall outside and you don't know what to wear to work? Today I want to bring to your attention this awesome compilation of 27 stylish women's fall outfits for work. First of all, I want you to know, it's not the end of the world, as there are thousands of awesome outfits to wear, but you have to bust out tights and cozy layers, so you feel comfort and warmth. Beige sweater looks perfect with high-rise straight black skirt. Complete the look by adding statement sunglasses, chunky necklace, golden bracelets, camel tote bag and embellished high-heels. There are thousands of awesome clothes you can wear to work, but in today's post I am going to share with you an awesome collection of timeless pieces to wear whatever the occasion is. These key pieces are possibly the most versatile garments in any woman's wardrobe, they are ladylike, match absolutely any outfit and allows you the freedom to add creative accents. Personally, I like the conservative touch of every showcased piece. With these wardrobe essentials you won't ask yourself: 'What to wear to work?.' Invest in timeless pieces and you will never be at loss for what to wear. Today I want to talk about office wear ideas for ladies. You are going to find here absolutely stunning creations that are great for those women who work in the offices, banks, big companies or have their own business. These awesome outfits will for sure inspire you to make some notes and recreate one of these pretty styles. 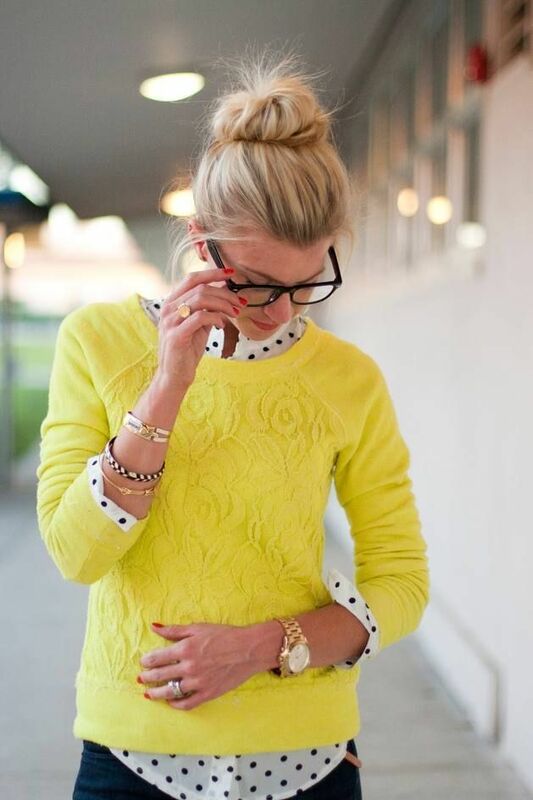 Here we see a bright yellow wool sweater worn atop white blouse printed in polka dots.